Last year’s Tangram puzzle had Alan Seeger’s poignant “I have a rendezvous with death at some disputed barricade” as its theme. This week, we had Chapsticks which I suspected was a misprint for Chopsticks, or indeed Chapped Lips, that somehow got through the vetting process! In fact, I probably know more about chopsticks and chapped lips than I do about the theme revealed by this puzzle. As usual, where there is more than one clue type, I found this a fairly tricky solve. At least we were told the number of each type with thirty definitions having misprints, and ten missing a letter. These together with either the first or last letter from ten answers would spell out a statement referring to an OED quotation. 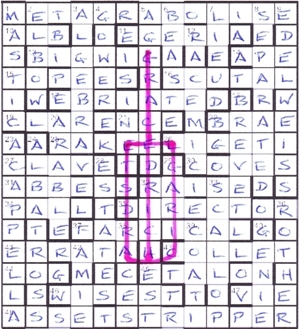 The last clue type resulted in the revealed statement being unguessable in places until pretty much the end: Overlapping names depict a near version of Lang’s fifth line. Off to the OED, only to discover two Langs. One of these, Fritz, had just one quotation, a somewhat inane comment, if you ask me, about the Western in American history. Even though I know little about cricket, it didn’t take long to spot GRACE followed by EDRICH down the middle of the grid. (I was helped with the latter by being born in Surrey.) A little inspired guesswork confirmed the other three as ELGAR, RICHARDS and STEEL to reveal a cricket bat. At least, I hope they were the required batsmen. Thanks for some good entertainment, Tangram, but I think I’ll stick to golf. This entry was posted on 15 December 2017 at 4:00 pm	and is filed under Solving Blogs. Tagged: Chapsticks, Tangram. You can follow any responses to this entry through the RSS 2.0 feed. You can leave a response, or trackback from your own site.